Not just time travel but alternate realities as well. Travelling backwards or forwards in time would be entering an alternate reality since the presence - or lack thereof - of the person traveling create it. So it's really the same thing. Well unless you subscribe to a closed loop system in which case there are no alternate realities, everything that happen is supposed to happen. I think that viewing history may be possible. Physically going there is a different matter. A history viewer would end the very nature of privacy, history is only one second or less ago. 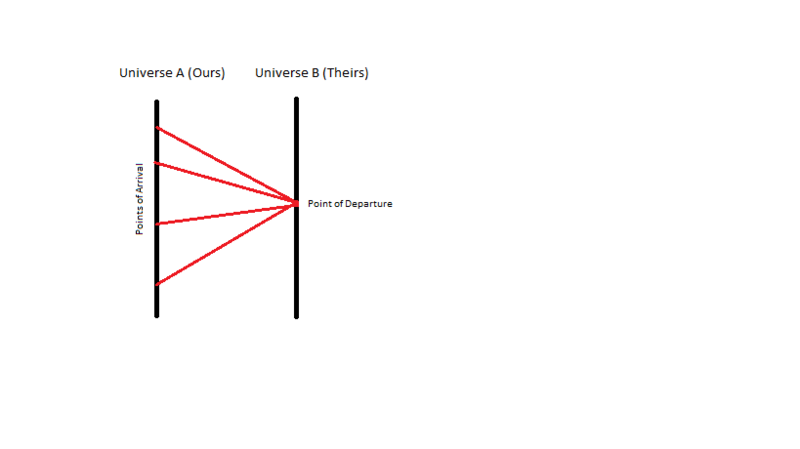 There is the block universe theory also. Do any of you believe that an alien civilization, if advanced enough, could travel backward in time or at the very least communicate backward in time? I believe the human civilization could if advanced enough. My thoughts are along the lines of “Universe Jumpers” slipping in and out and skirting the multiverse. Somehow these beings or sentients figured out how to, just like a dog figures out how to dig out of his cage, it’s inevitable. Maybe they are from a universe where time works differently. They could have all left to come into this universe for whatever reasons at the same time, but from our perspective they show up at different times in our history. That would at least solve the argument of why they would need to do the same experiments for so long and so many times. How would they get here? I haven't the foggiest. Just sort of spit-balling. When you are abducted you move ahead in time on this timeline...when you are in the Craft you experience no time....the function of the Craft changes your timeline experience. There are mathematical solutions within relativistic physics that say it is possible. Mathematical is indeed the key word here. The fact that RT allows for such nonphysical solutions is a sign that it is not a fully correct/complete description of gravity imho. It would also explain why it is so hard to unify with the standard model.